This spicy, no-cook soup is less than 200 calories per serving and is perfect for a late summer lunch or dinner. If you read Health, you know we're crazy about avocados. They're rich in healthy fats, vitamins, and they boost your metabolism. 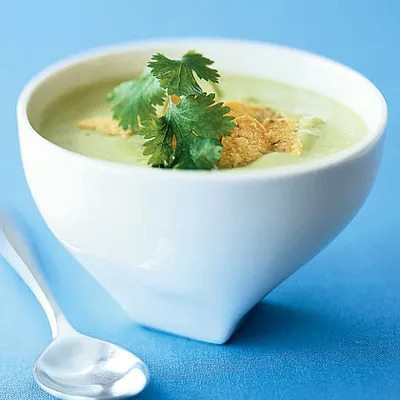 In this chilled soup, which has 7 grams of keep-you-full fiber, you simply whip 8 ingredients together in two steps (Hint: Throw everything in the blender, then chill.) This recipe is so easy, the hardest part will be cutting open the avocado--and we bet you're a pro at that. What are you waiting for? Make this delicious recipe today. Ingredients: Avocados, vegetable broth, green chiles, milk, lime juice, salt, black pepper, tortilla chips for garnish. What Can You Make With Avocado?